Bobby MacLeod was one of Scottish dance music’s most innovative and inspirational figures, a melodeon player and composer of conspicuous talent and a band leader who really understood what it meant to play for dancing. Bobby was born in Tobermory on the Isle of Mull on May 8, 1925. His parents were both from Wester Ross, where they developed their love of piping and Gaelic song that they passed on to Bobby. Bobby was just four years old when he was given his first set of miniature bagpipes and through lessons from his father and further refinements from Pipe Majors William MacLean and William Ross, he was competing successfully at junior level while still at primary school. By the time the Second World War broke out in 1939, Bobby was a proficient pibroch player and had made his first BBC broadcast. 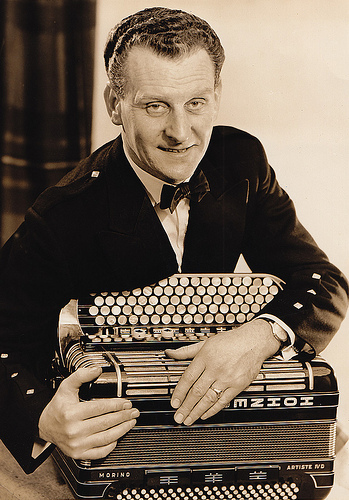 At this point, he had also become an accomplished dancer and moothie player and at the age of ten had discovered the melodeon through hearing one played in the family hotel, the Mishnish in Tobermory. He bought his first box, a ten key Excelsior for 12/6 (62 pence), and began practising, going on to play at local dances. He continued playing for dances and entertainment during his national service with the Royal Air Force. Then, following his demob in 1946, his musical career began in earnest. Unbeknownst to Bobby, his mother had contacted the BBC about her talented son. Called for an audition, Bobby passed and was given a solo spot on the Accordion programme. Shortly afterwards Bobby put together the first edition of the band that would gain him international renown. With a rhythm section that could play jazz as proficiently as Scottish music, a second accordionist adding imaginative harmonies and a fiddler matching Bobby’s melodic effervescence, the Bobby MacLeod Band had a sound and sense of swing all of its own. This fresh, invigorating, pipe tune-influenced approach quickly made an impact through radio broadcasts and at dances where Bobby assessed the dancers’ preferences and set the tempo to suit. By now full-time professionals, the band also impressed studio engineers and fellow musicians when recording in London for the Beltona, Parlophone and Phillips labels, routinely laying down entire long players – ten or twelve tracks – in first takes. Television appearances, notably on The White Heather Club, tours of Canada and America and an appearance at the World Youth Fair in Moscow enhanced Bobby’s reputation and a full diary kept the band busy until Bobby decided to retire from the road and return to the family hotel in 1958. He continued to record, assembling bands of outstanding musicians, including Angus Cameron, Ian Holmes and Jim Johnstone, especially for the sessions, and played occasional accordion club gigs and oversaw the post-Tobermory Games ceilidh until his death on January 26, 1991. A man who greeted life with the same enthusiasm as he approached music, Bobby had many interests, including sailing, local council work – he served as Provost of Tobermory for fourteen years – and helping to found Mull Festival. He is remembered most of all, though, for his immense contribution to Scottish music and not least his compositions Murdo MacKenzie of Torridon, The Lothian Waltz and Jean’s Reel.